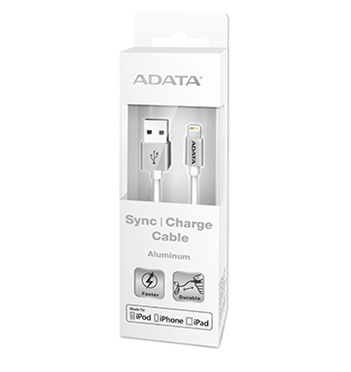 ADATA’s Apple MFi-certified Sync & Charge Lightning cable provides a hassle-free way to charge your iPhone, iPad, and iPod, and sync data across devices for highly efficient mobility! With strong multi-layered construction and tinned copper, the ADATA Sync & Charge Lightning cable is highly durable and provides rapid charging up to 2.4A while preventing harmful EMI. If you also have an Android advice, you can choose the 2-in-1 version with a micro-USB port. The Sync & Charge Lightning Cable is a stylish mobile accessory that's available in several vivid and metallic colors to meet your personal style, and comes with a color-matched cable tie for easy storage.